Sixteen-year-old Bri wants to be one of the greatest rappers of all time. Or at least make it out of her neighborhood one day. As the daughter of an underground rap legend who died before he hit big, Bri’s got big shoes to fill. But now that her mom has unexpectedly lost her job, food banks and shutoff notices are as much a part of Bri’s life as beats and rhymes. With bills piling up and homelessness staring her family down, Bri no longer just wants to make it—she has to make it.On the Come Up is Angie Thomas’s homage to hip-hop, the art that sparked her passion for storytelling and continues to inspire her to this day. It is the story of fighting for your dreams, even as the odds are stacked against you; of the struggle to become who you are and not who everyone expects you to be; and of the desperate realities of poor and working-class black families. You know that moment after you finish a book where you close it, clutch it to your heart and let out a sigh? You just sit there for a few more moments with your eyes closed, collecting yourself. I am going to start calling those the 'Angie Thomas Moments', because I had the same thing happen with The Hate U Give and now with On the Come Up. Angie Thomas's second book On the Come Up was just as beautiful, honest and heartfelt as her first. 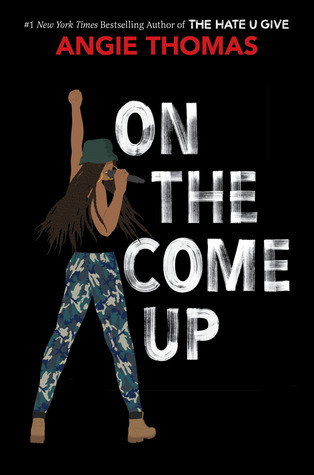 On the Come Up, also taking place in Garden Heights, tells the story of Bri, a 16-year-old girl who is going after her dream of becoming a female rapper. As we know with Angie Thomas, this story does not come without its hardships and difficulties. She writes deep and powerful novels that tackle real and relevant issues, and that stays true with On the Come Up. As the story unfolds, Bri and her family are trying to survive through some of life's hardest hands and situations. It's through these emotional times that Bri turns to her music. Her anger, hurt, frustrations, and sadness comes out in her rhymes. Her lyrics leaping off of the pages and swirling around you. It made for a really powerful reading experience. Bri was such a compelling character. She was smart, talented and funny! She gave this book so much personality! I found myself smiling or laughing my way through a lot of it. Bri may be the main star of On the Come Up but all of the characters brought this novel home. Malik and Sonny, her best friends, were fantastic. They were heart-warming and funny. I was not surprised one bit that I loved this novel. Angie Thomas had me hooked since her debut. She will be an auto-buy author of mine from here on out. I eagerly look forward to her future work, but until then, will happily re-read her previous novels to tide me over.